Making your kids eat vegetables is a challenge these days. I remember when we were small we would obediently eat what ever was served to us without making much fuss . But with the change of lifestyle and economy things have changed . Kids do not want to eat green vegetables , instead love to have junk foods like Pizza’s , Burger’s , Sandwiches , Chocolates etc. So I always try to find out ways to make my kids eat vegetables. Sometimes I add vegetables to fried rice and paneer curries , some times to daals like Moong dal with added vegetables. 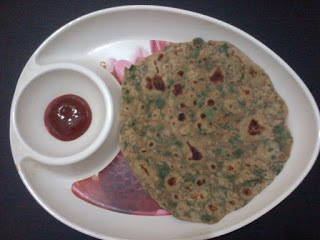 So a new recipe which I tried and was very successful is Palak Paratha –Paratha made with finely chopped spinach leaves . It looks very good and also tastes very good . My kids loved it and now I prepare it regularly . Today I will share my recipe of Palak Paratha. 1. Wash and chop spinach leaves. 2. In a mixing bowl add wheat flour , salt , saunf , spinach leaves , little ghee /oil and knead the flour adding little water. 3. Make equal sized balls from the flour . 4. Roll it using rolling pin , the parathas should be little thick then normal phulkas or rotis. 5. Cook it on a hot tawa turning both sides and adding little oil or ghee . 6. Cook till crispy . This delicious paratha can be served with Tomato ketchup or Pudiney ki chutney . Good for break fast and can also be given in Lunch box. Since it is made from wheat flour and not white flour its healthy , spinach is a good source of iron so very good for health.I use ghee for its preparation as it gives a nice aroma and taste. I add saunf as it gives a unique taste to paratha and also helps in digestion of food. So this way we can innovate new dishes which are healthy and delicious .